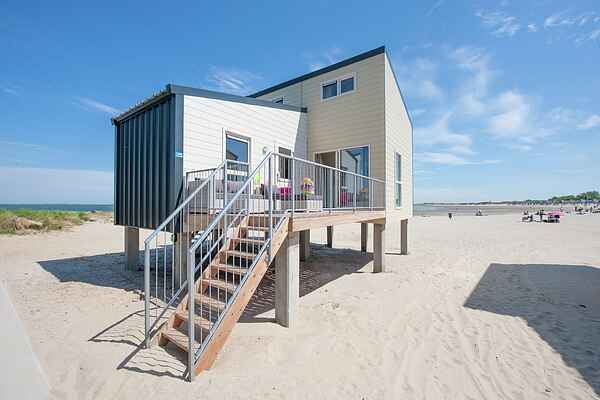 These Beach Houses are directly on the beach, the ultimate outdoor experience. You'll have a beautiful view over the beach and the sea. Because the houses are built on poles, you'll reach the entrance via the stairs. Two of the three bedrooms are on the ground floor. One of these bedrooms has a bunk bed. The others have two single (box-spring)beds. The kitchen is fitted with all modern comforts. There's a dishwasher, a microwave and a refrigerator with a (small) freezer. There's a smart-TV in the living room. On the wooden terrace, you'll find a lounge set and a beach wagon. A vacation in these Beach Houses offers a unique experience.